Simply, the timer clocks we find in stores have to be plugged in to the electrical current to work. 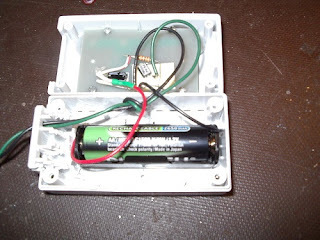 It becomes very difficult when you require something that works on batteries The best solution is to build yourself one. It is easy to turn an electrically operated timer into a battery operated timer. 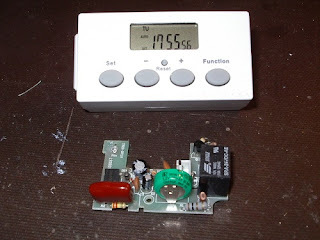 First of all, the timer has to be disassembled. This is pretty simple. All that is needed is to remove the screws that hold the back cover in place. The timer will then split. It must be separated carefully to avoid any damage on the screen or inner controls. Once it is disassembled, the original PCB should be removed completely, in order to gain access to the full back cover. Now the space is free, the only thing available is a totally useful space that comprises of the plastic marks and walls used to set and hold the original PCB. The plastic features can be removed by using a Dremel tool. It is highly recommended that some kind of mask or protection for eyes, nose and mouth should be used while using the Dremel tool because it produces some dust. After clearing the space completely, it is time to add the new connections for the battery. All that is needed is a AA battery holder, which can be acquired at any electronics store, and the proper connections to feed the battery power to the timer.